One “yum” is not enough to encapsulate the experience of what has become a confectionary mainstay of downtown Wolfeboro. Generations of seasonal visitors and year-rounders were disappointed to learn of the Yum Yum Shop’s closing following the passing of long-time owner Lou Kelly a few years ago. Lou passed away at the age of 78 in 2015. But his son, Peter Kelly, kept the business running through the following season as folks expressed their ongoing support. In the fall of 2016, however, the Yum Yum Shop announced that it was closing. 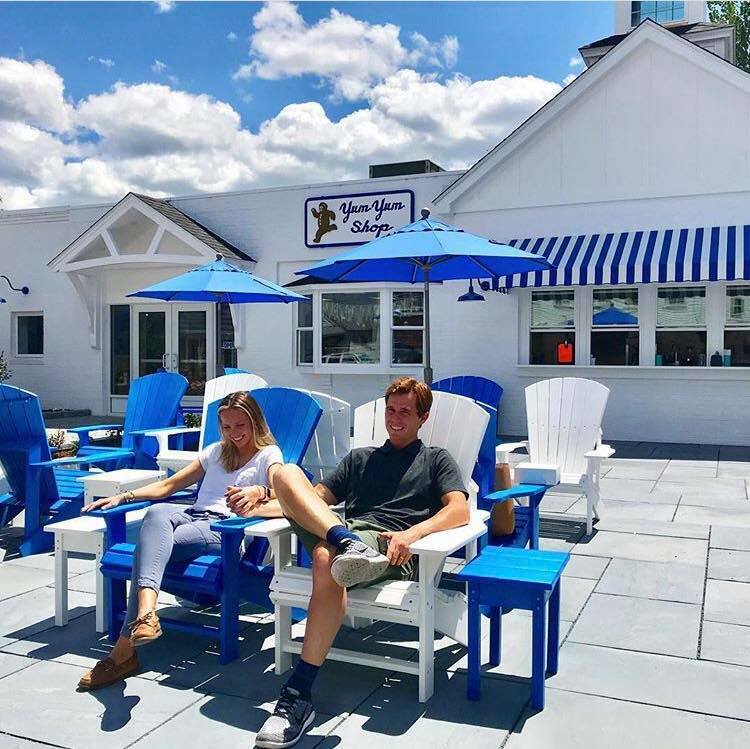 Folks who posted on local forums and Facebook groups began wondering out loud what a post - Yum Yum Wolfeboro would be like. None of the scenarios seemed particularly positive. Given this outpouring of support, Peter Kelly felt compelled to reopen the Yum Yum Shop in 2018. So, after being shuttered for a year-and-a-half, the Yum Yum Shop in downtown Wolfeboro is again serving up baked goodies and ice cream confections - continuing a 70-year legacy spanning three generations. “It just seemed like the right decision,” Peter Kelly said. The Yum Yum Shop re-opened in May and had a Chamber of Commerce-sponsored ribbon cutting on July 2 - right before the town’s iconic Independence Day Parade, which draws a few thousand spectators to downtown. As always, thanks to Peter, a trip to this South Main Street landmark will yield a trove of goodies. The well-manicured landscape and tidy exterior will welcome you and the aroma of fresh-baked treats shall tempt. A single bite will draw you over into a wonderland of turnovers, cupcakes, and artisan breads. A visit to the Yum Yum Shop can be either a dive into decadence or the ultimate test of will power for those sweet of tooth. What will you find at the Yum Yum Shop? Handcrafted pastries made with any and every berry imaginable? Blueberry. Blackberry. Strawberry? Lou was an artisan and a yeoman. He’d stir himself from slumber in the wee hours. Lou was working before dawn - well before a lazy sun could spread her tiny tendrils of light down upon the Bay. Lou made the dough. Lou prepared the confections. Lou made sure you’d get your yum. Come sunrise, it would be showtime - and the Yum Yum Shop was always ready. In spite of the fact that every confection that passed through Yum Yum’s doors bore the pride of Lou’s workmanship, he was initially a somewhat reluctant baker, according to his son, Peter Kelly. Peter re-opened the bakery last spring and is continuing forth with the family legacy. “He actually had a degree in engineering,” Peter explained. He noted that his grandparents began having some health issues in the sixties, and that Lou agreed to help his folks out. Peter noted that, at the time, his father was a key player in designing the Massachusetts interstate highway system. Originally, the Yum Yum Shop was located across the street, at the present location of the Art Place. The bakery occupied that space for nearly three decades, from 1948 to 1977. In that time, the business’ clientele grew and eventually outstripped the physical limitations of the facility. In the 1970s, there was a defunct Gulf station across the way on Main Street. The Kellys acquired the building and modified it to become their new home base. “It was the right move at the right time,” he said. Peter has fond memories of his father. “Even though he studied engineering and was on a certain career track, when he came back to help out, he was all in,” he noted. Locals who knew Peter’s dad might recall him as a little gruff. “Yeah, he did have a little reputation as being a bit rough,” Peter conceded. “But the kids that came in made him light up,” he noted. “When he saw them enjoy something he made, it made him so happy,” Peter said, hoping to continue the legacy. While he intended to help out temporarily, some 50 years ago, as time went on, Lou became increasingly immersed in the bakery. While he wasn’t devising transportation solutions for a nation on the move in the 1960s, he was rather engineering mouth-watering confections that would earn the family business generations of loyal customers. For a while, the Yum Yum Shop seemed to be on the brink of a regional baking empire. Lou was able to negotiate a contract with the Demoulas family to operate remote bakeries throughout the region within the company’s expanding Market Basket grocery stores. “I was pretty young back then, but I remember the late 1970s and 80s was a time of expansion,” Peter recalled. He noted that the remote bakeries were profitable and mutually beneficial for both the Kelly and Demoulas families. But it did not work out, so the Yum Yum Shop retrenched at its Wolfeboro home base, where it continued to thrive and serve a large local clientele. In the early 2000s, Lou considered retiring. Back in 2004, there were indeed rumors, but talk aside, Lou soldiered on. Until the end. To help bridge the gap and get the bakery through the 2016 season (there’d been honor-bound agreements for some events that year), Peter took a hiatus from his sales post at Allstate to pitch in, just as his father had done a half century ago. Peter said that he’d intended for the gig to be temporary. “We wanted to see things through - at least for the short term,” he summarized. And he did. Special orders were fulfilled. Daily customers were satisfied. And in late 2016, Peter planned to hang up the closed sign at the Yum Yum Shop for good. But Wolfeboro wasn’t about to let this happen. Peter said that the words of a young couple - Ashley and Spencer Samuelian - were vital. To date, they are key players at the bakery, providing support, while Kelly manages the day-to-day operations. “They have been super supportive, and we’re all so appreciative,” Kelly said of the Samuelians. After the shop’s initial closing, online began lighting up. Signs bearing beseeching messages appeared on the property. Peter is smart. He got the message. He had the opportunity to continue a family legacy and move it forward. And the community has responded. The Yum Yum Shop still draws. “It’s been a good season with people enjoying some of our traditional favorites and some of the new offerings,” Kelly said. “We might have a new twist to add to the things people expect, so please do stop on by,” he concluded. Peter hinted that chocolate will be involved. “We’ve gotten some requests and we try to be responsive.” he noted.